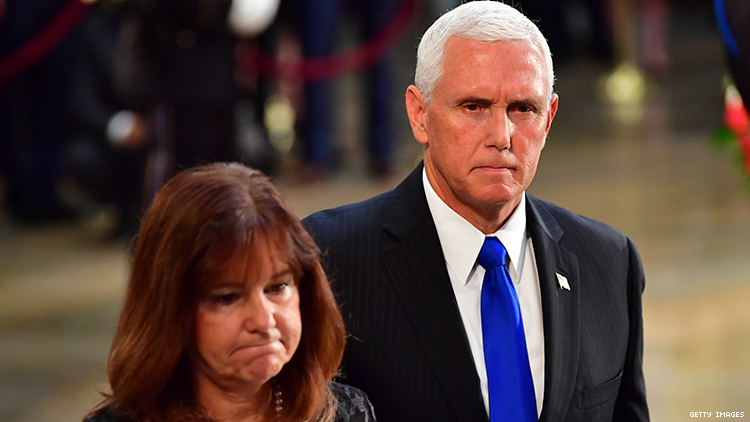 On Thursday evening, amidst the longest government shutdown in United States history, Vice President Mike Pence went on EWTN, a cable network that purports to offer “news from a Catholic perspective,” to express how upset he and his wife, Second Lady Karen Pence, were over criticism of her new part-time job teaching art at a school that explicitly bans LGBTQ+ students and faculty. To clarify, the criticism he’s referring to is not about, as he says, “Christian education,” but of the employment application and parent agreement at Immanuel Christian School in Springfield, Virginia. On Wednesday, Kara Brooks, the communications director for Mrs. Pence, told the New York Times in an email: “It's absurd that her decision to teach art to children at a Christian school, and the school's religious beliefs, are under attack.” One could argue that it’s absurd that a school would openly discriminate against prospective students and faculty. Absurd perhaps, but legal. West Virginia is one of fifteen states that offer no statewide protections for LGBTQ+ employees. However, public condemnation in past instances has pressured schools to reverse their policies. Such was the case in 2016 when a Rhode Island private school ended up reversing its ban on transgender students. Will that be the case now? Likely not, considering the ongoing attempts to normalize discrimination against marginalized communities by the Trump administration. GLAAD is calling on Mrs. Pence to step down from her position and “join the faculty of an institution that values and supports the acceptance of all students.” But if the Vice President’s latest interview is any indication, when it comes to LGBTQ+ people, the Pences DGAF.